Download and run the ReDash.jar file. For this you only need a Java Virtual Machine installed. Luckily at least Java on Windows allows you to launch jar files directly after downloading nowadays. If not, and you're running Windows, you might find it handy to use ReDash.bat to run the app, just save it in the same directory where you save the .jar file. If you're running a *nix or something else I trust you're capable of typing "java -jar ReDash.jar" yourself. Finished in the beginning of 2004 as a part of the Programming Graphical User Interfaces -course in the University of Tampere. Unlikely to be further developed by me. I was going to put the source on display too, but it's not as well commented as it could be. Ask me for it, and I will send it to you. The specifications for the application and some code, including the algorithm for rendering the nodes, provided by Jarkko Leponiemi. Before building this, there was also a prototype made with MFC in C++. 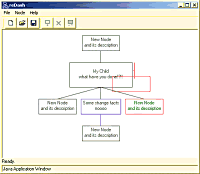 This application uses the Model View Controller design pattern. Usability: there is no undo, and just dragging a node far enough from the tree currently results in total destruction of the node. For such a small and simple one, this application takes up a *lot* of system resources. On my 1433MHz AMD machine with 512 MB RAM it runs smoothly, but on the dept. Linux machines moving nodes etc is unacceptably slow. Also, initial memory usage of 16 MB just seems too much. This could be optimized by using the "dirty" variable of the BinaryTree example in the course material - making sure the locations of the nodes aren't recalculated unless needed. Also, repainting only the areas that have changed would probably be smart. Giving up using absolute units (pixels)? More efficient usage of screen real estate. In the current implementation of the drawing algorithm a node takes up all the horizontal space required for its siblings. Different image files for 16x16 and 32x32 icons - possible in Java at all?